Can we fill the triangle with some color? Then we have to compute x_left and x_right. This is slightly tricky, because the triangle has three sides, not two. However, in terms of values of \(y\), we always have a “long” side from \(P_0\) to \(P_2\), and two “short” sides from \(P_0\) to \(P_1\) and \(P_1\) to \(P_2\) 1. So the values for x_right will come either from the long side or from both short sides; and the values for x_left will come from the other set. x02 will be either x_left or x_right; the other one will be the concatenation of x01 and x12. Note that there’s a repeated value in these two lists: the \(x\) value for \(y_1\) is both the last value of x01 and the first value of x12. We just need to get rid of one of them. Now the only thing left is to draw the horizontal segments. For reasons that will become clearer later, we won’t use DrawLine for this; instead we’ll draw the pixels individually. 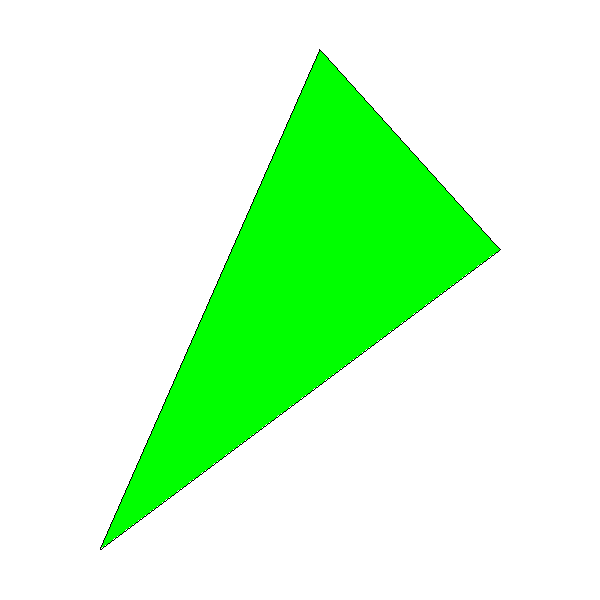 You may notice the black outline of the triangle doesn’t match the green interior region exactly; this is especially visible in the lower-right edge of the triangle. This is because DrawLine() is computing \(y = f(x)\) for that edge, but DrawTriangle() is computing \(x = f(y)\). This is the kind of approximation we’re willing to pay in order to achieve high-performance rendering.